I eat in a lot of expensive restaurants. I also have plenty of "go to" spots around Prague for inexpensive meals. In addition to good value, I've also looking for something that tastes good -- or at least not too bad. And when I talk about taste, I'm just talking about what appeals to me. Those who live here will have their own favorites. 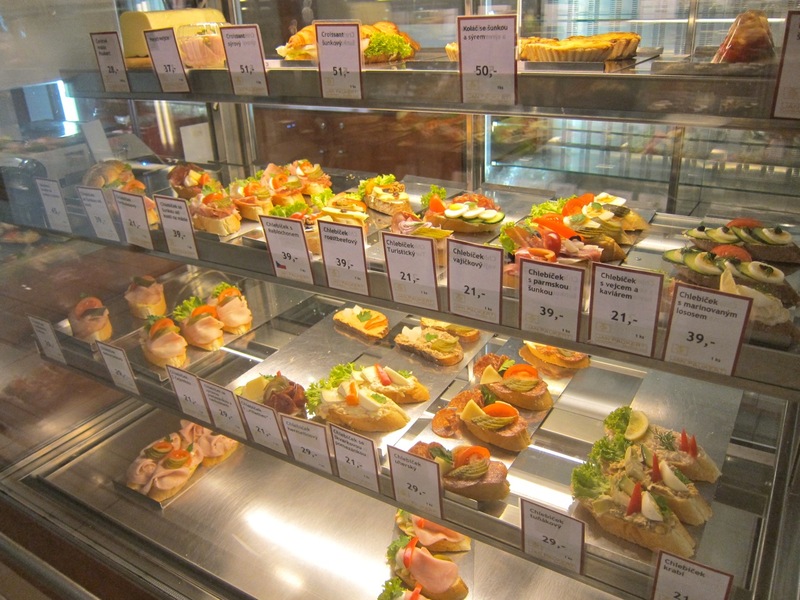 Prague is full of low-priced offerings, especially at lunch time. I couldn't begin to list them all. What I will do, however, is give you my list, in no particular order, of places I like or know about that I stop at for a low-cost bite or two. 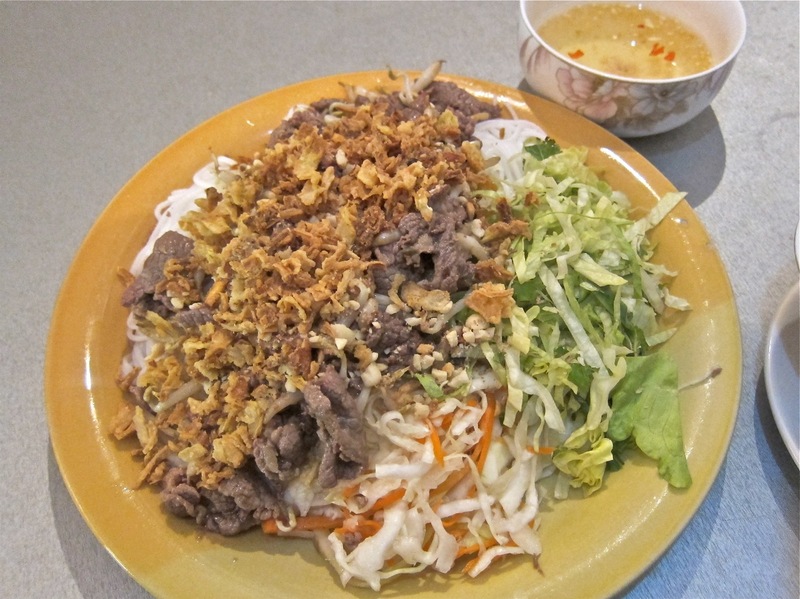 I wrote about this Vietnamese place with no tables just recently and it has become a favorite. I recommend the Bún Bò Nam Bộ (85 CZK) and the fresh (unfried) spring roll filled with shrimp, pork, and egg (30 CZK). 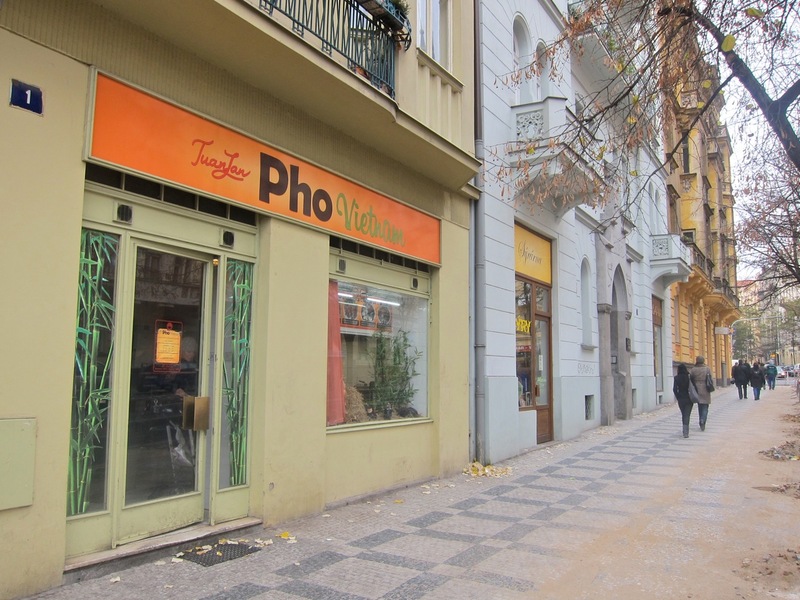 Real Vietnamese cooking is the up and coming cuisine in Prague these days. I'd also recommend Red Hot Chili in Karlin for their breakfast-only banh mi sandwich. Or try one of the small shops at SAPA market in Prague 4 or Holešovice Market. 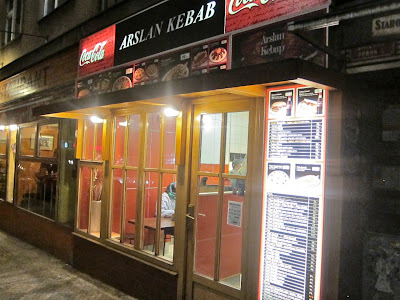 Prague has a number of kebab shops, and many people I spoke to agreed that Arslan Kebab is a stand out. The small, Turkish-style doner kebab with the beef/lamb mix (49 CZK) is delicious. I went last week and the meat was freshly shaved. The salad in the bread, from onions to cabbage to tomatoes were fresh and well-kept. I've seen more than a few shops with tired-looking stuff and dried out meat that was shaved long ago. 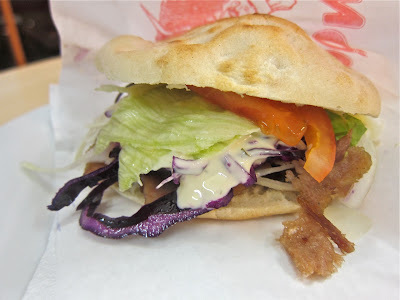 They do their own bread, in addition to Turkish "pizza" or pide and it's very good. Also worthy in the area are the kebabs at the Middle Eastern spot, Safir, at the top of the Nový Smíchov shopping mall. This is a nice little place in Karlín that specializes in soup. A small bowl is 36 CZK and a large is 57 CZK. They do recipes like chicken with tarragon or tomato cream with fresh basil. They almost always sell it all, and by the end of the day, they usually only have their borscht with beef. 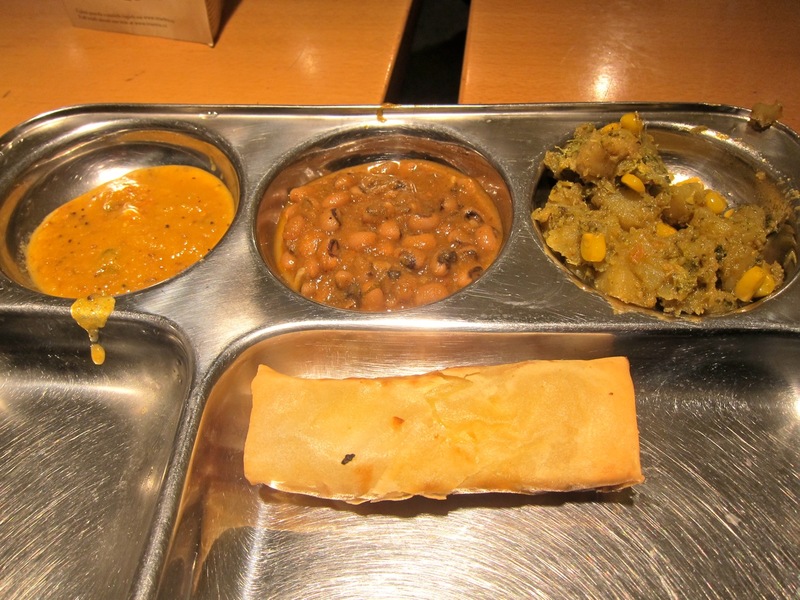 Chačapuri (Khachapuri) or cheese bread with meat (45 CZK) or spinach or beans (32 CZK) can help fill you up. Expats.cz did a bigger article on other soup joints like Dobrá polévka, Polévka je Grund, Home Kitchen, and others. 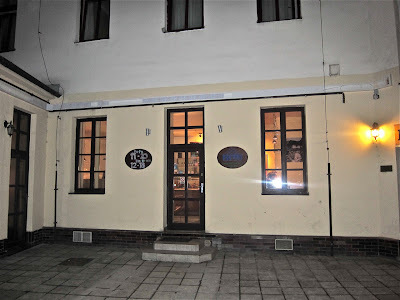 I'm a big meat eater, but I stopped by the Bea's hidden in a little courtyard on Týnská recently. I got this plate with a cabbage-filled spring roll, onion chutney, potato, broccoli and corn curry, and spicy beans. It was all quite tasty, with a fair amount of heat. I must add that at the end of the day, the food has been sitting around a little too long. This platter cost 49 CZK, and they had free green tea, They do take the "sitting around" factor into account and offer 30% discounts one hour before closing time. Want something more Czech? Try Jan Paukert on Národní for their chlebíčky or small, open-faced sandwiches. Mr. Paukert is said to have invented them. They go from 21 to 39 CZK. I like the kind with ham, egg, pickles, and potato salad. 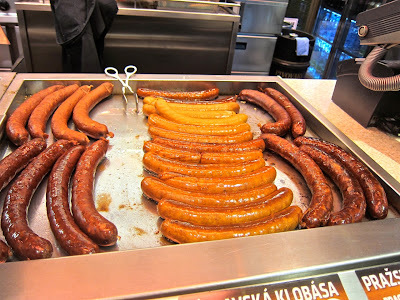 I'll confess it's been a long time since I've partaken in a sausage at Wenceslas Square. I used to eat them more often, even though they don't fit so easily into my "good taste" requirement. Perhaps my judgment was impaired by my choice of beverages. Almost five years ago, I wrote a blog post about trying many of them. 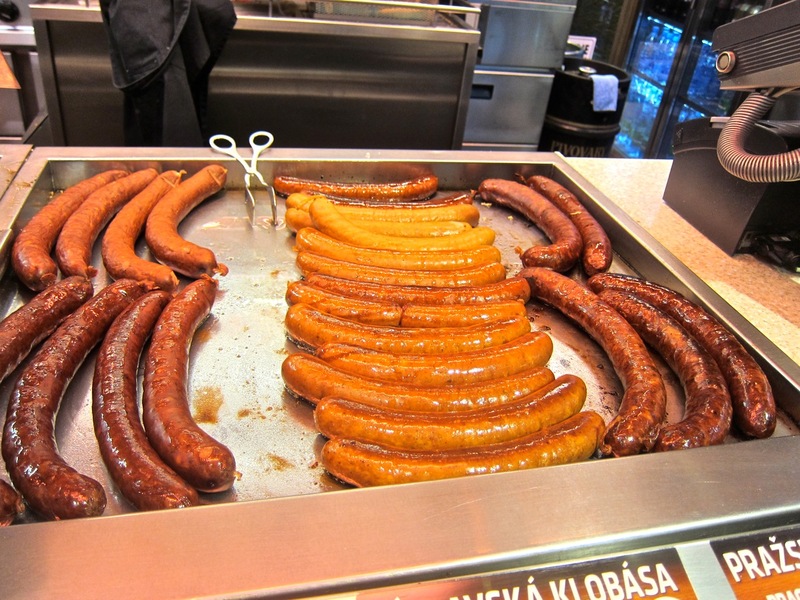 A favorite from then was the garlic-studded Pražská klobása (Prague sausage). It was 50 CZK in 2007, but now cost 60 CZK. I also liked the little white Norimberske (Nuremburg) links (50 CZK). But you better get them while they're hot and before they're not. There is a plan to eliminate some, if not all of the sausage stands as part of a major beautification project. 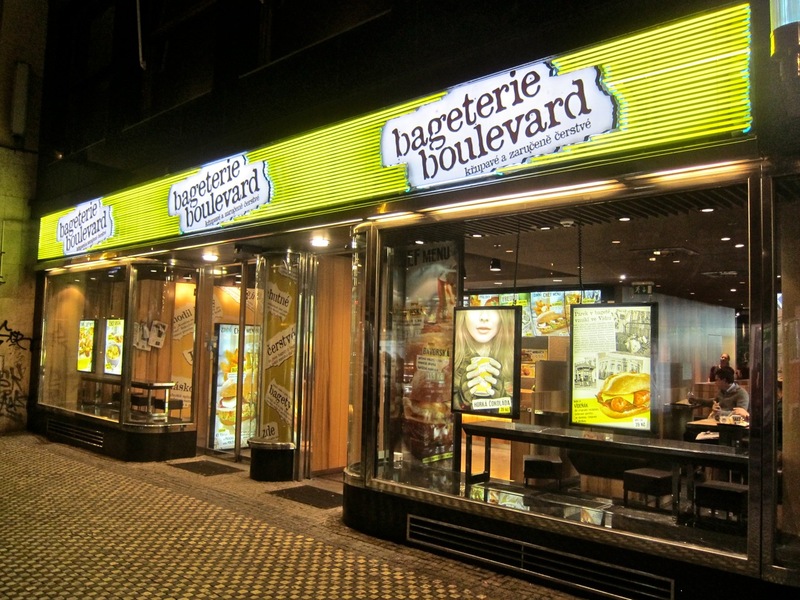 If I have to choose a fast food chain, this is the one I usually go for. Why? Basically, I love the warm, crispy baguettes they use for sandwiches. Although the quality of what they put inside them is not always the highest, they are fairly creative. 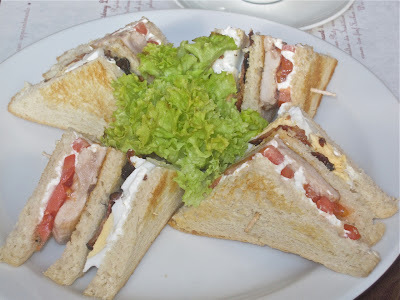 My favorite sandwich is the Brooklyńska (89 CZK). The baguette (you have a choice of three different types) is filled with turkey, grilled onions, cheese, tomato, bacon, and mustard dressing. I'll also confess to liking their "hot dog," called the Vídeňák or the Viennese (39 CZK). It's two small dogs on a warm crunchy roll with bacon, grilled onion, and cheddar. The ketchup and mayo on it is not right for me, but I've grown to accept it. I must add that I love their homebrewed iced tea (37 CZK). It only comes pre-sweetened and flavored with lime, but I like it this way. I lived for years in the sweet tea region of the USA. They also sell it in take away bottles (39 CZK), but it has a limited shelf life. There are locations in Old Town and Vinohrady. The pizza here is hit and miss. You have to be open to choosing a slice (30 CZK) from the freshest pie, regardless of toppings. 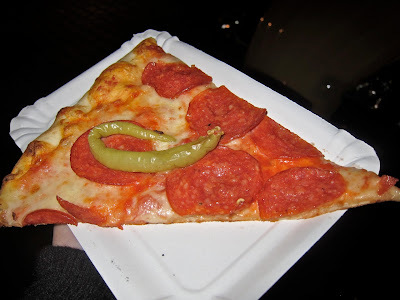 I advise against ordering the older slices, even if it has the topping you prefer. The crispy crust combined with the decent, slightly sweet sauce and fresher cheese usually satisfies. 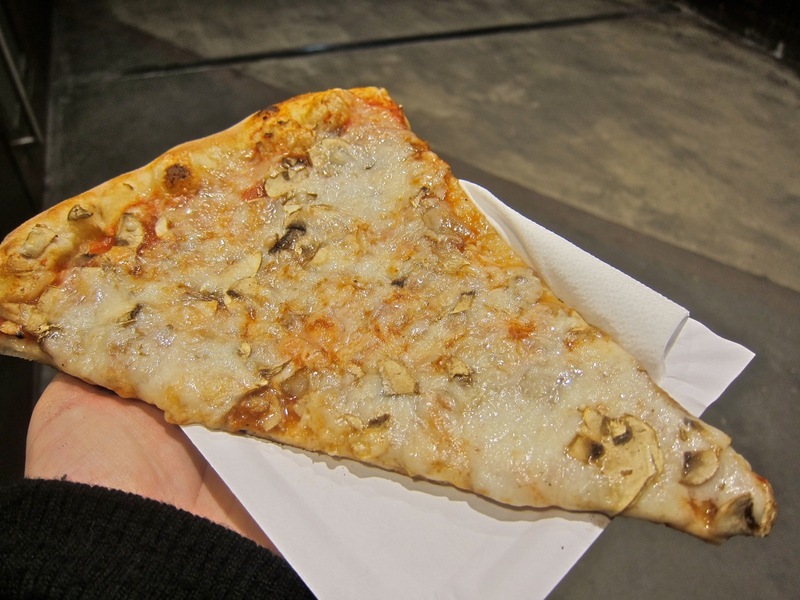 For the same price, you can get a much larger slice at the pizza and gyro shop underneath Kotva at Náměstí Republiky. Make sure to tell them to make it hot, as they often rush it in and out of the oven. 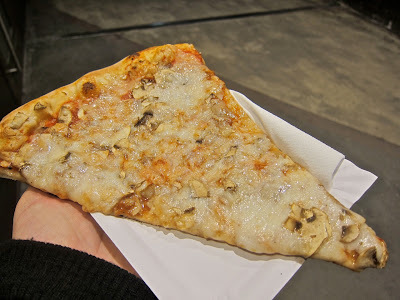 This slice reminds me a bit more of a New York pizza. The well-heated crust is good, but the sauce, with a nice hit of oregano, is a bit thin. 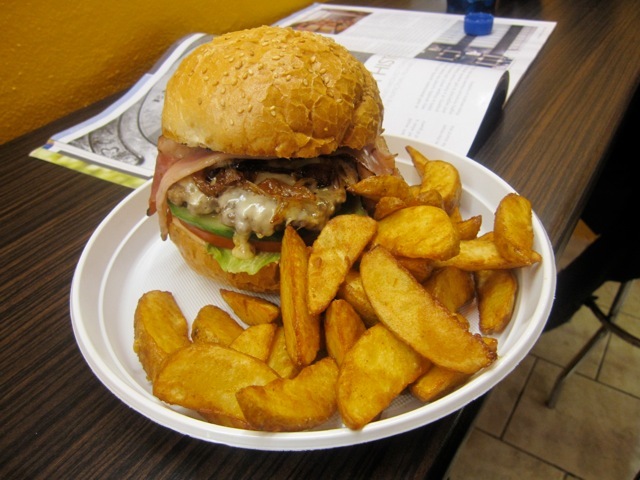 Some claim that this párek v rohlíku (20 CZK) is the best in the city. I don't know about that and I'm not willing to find out. But I do pass by often and when I need an emergency food fix, I'll grab one. 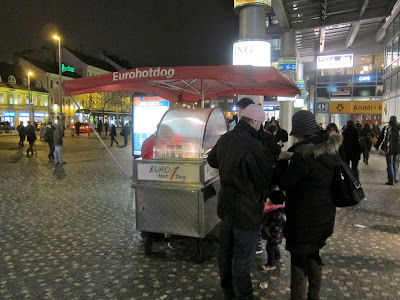 There are also Eurodog stands outside the Anděl (classic is 15 CZK) and Malostranská metro stations among other places. These dogs don't compare to what you'll find on the streets of New York, but they are cheap, fast, and get the job done. 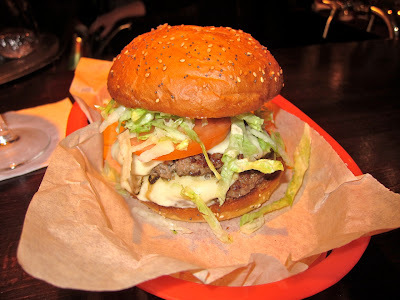 Sometimes these burgers can be pretty good. Sometimes they're not. There is some luck involved. Either way, if you take your chances, they are huge and cheap. I get the Big Queen's Burger (82 CZK) with ground beef, mayo, lettuce, tomato, cucumber, cheese, bacon, fried onion (I recommend asking to hold the cucumber). For much higher quality, go to The Tavern. This restaurant is not open full time until March, but their Lokal Burger and Blue Smoke Burger are among the best in town for a little over 100 CZK. 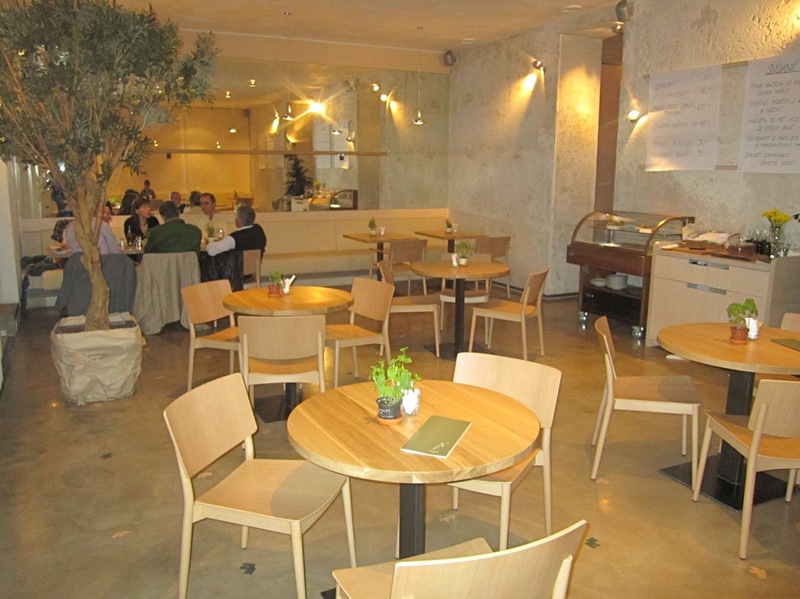 If I'm going to sit down in the center for a real meal, Mistral Café offers some of the best value. 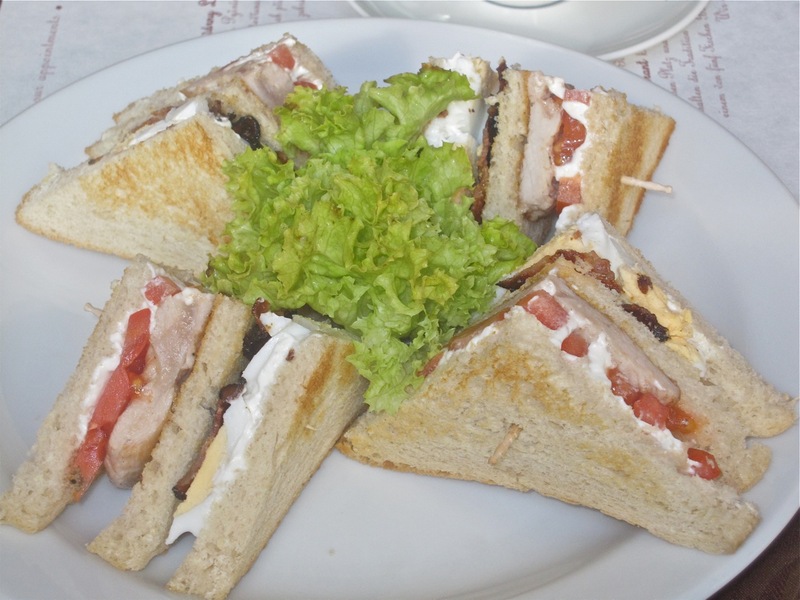 There are sub-100 CZK lunch specials, and their regular menu has Czech and creative-non Czech items in a place with an art gallery feel. I recommend the pumpkin soup with grilled chicken (79 CZK), or the forest mushroom ragout with thyme and onion over potato cakes (98 CZK). The place was deserted the first three months it was open, but the secret is out and now it's regularly packed. Another favorite in the sit down restaurant category is Café Louvre. You get style, history, and decent, occasionally pretty good food. I usually go for the club sandwich, a Mattoni, and a hot chocolate, but I'm not sure everyone will love this combo as much as I do. 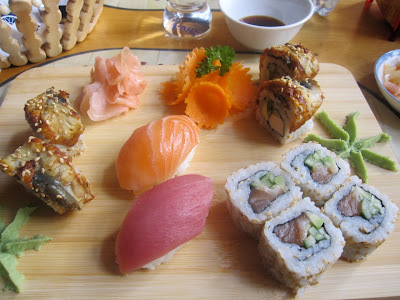 Cheap sushi is something that was missing for a long time in Prague. Sushi Tam Da, which I wrote about back in 2010, was a pioneer in this area. Its few tables are often full now, and I usually get an order to go. My favorite sushi menu selection for its price and quantity is the B23 -- that's an 8 piece salmon, avocado, and cucumber roll coated with sesame seeds (118 CZK). At 290 grams, that order alone could be a satisfying and healthy lunch. A piece of salmon nigiri is just 34 CZK, which is less than half what it cost at many restaurants in the center. A number of other restaurants following Tam Da's model have popped up around the city like Asian Fast Food Binh Minh at Strossmayerovo náměstí. 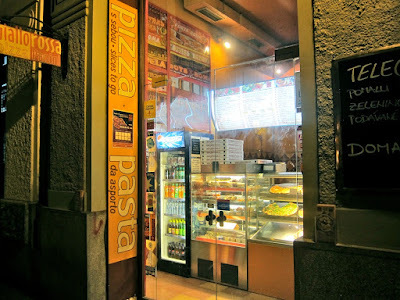 As always, I'd love to hear any suggestions of your favorite cheap eats. If there are items on my list you find too obvious, unworthy, or even repulsive, I'll understand. Everybody has difference tastes, experiences and limits for price to quality. In any case, the food is pretty cheap and so is my advice. 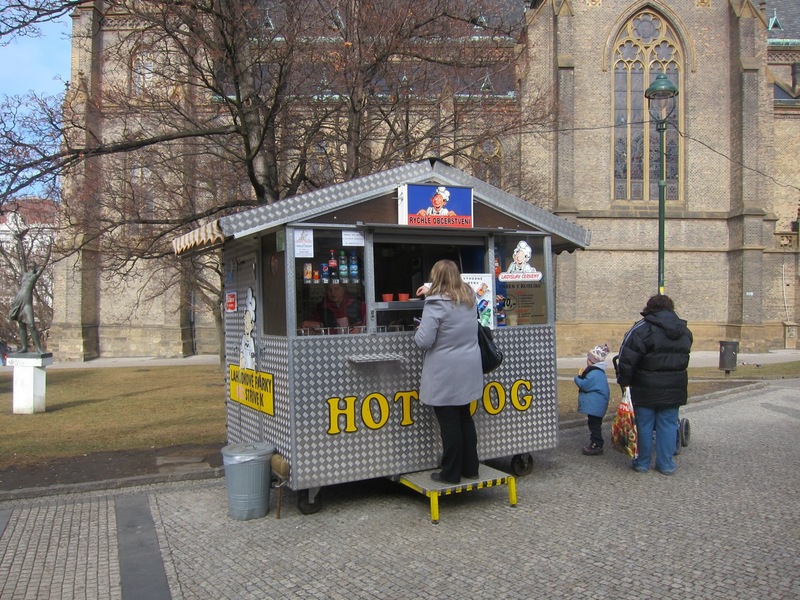 i remember back in 2001 there were hot dogs with white sausages in staromesty namesti for 20czk, they were great.. 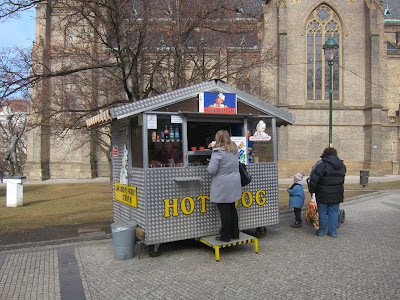 This is about the hot dogs at Namesti Miru stand. 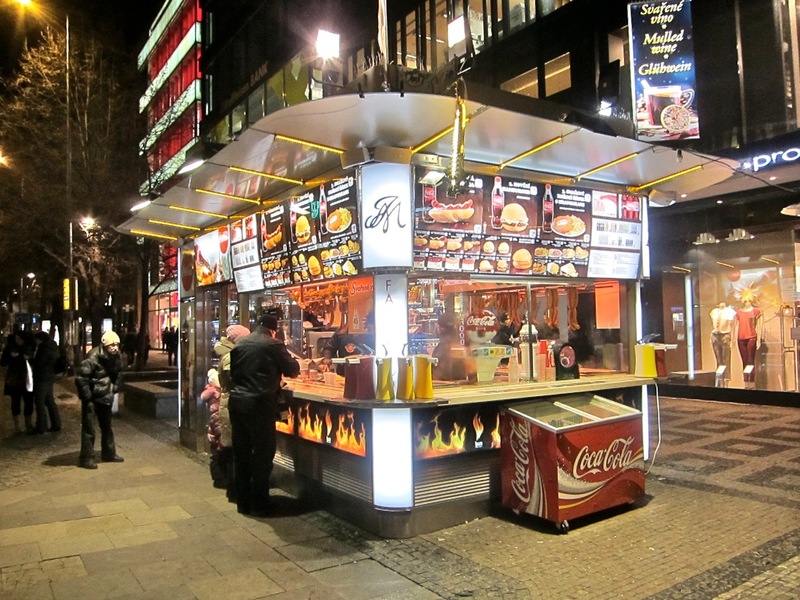 I was working in an office on the second floor of the Cultuni Dum on namesti miru in 1995 and I can tell you that the hot dog stand at the same spot at that time WAS the best in the city - but only if the girl was working - not the guy. I see a problem with this one in the picture. No line! The old stand was one of the old type that they had to set up in the morning. It would start with not even enough room for the girl to move because it was so full of crates of rohliky. There was a line of at least 6 to 8 all day until the rohliky ran out sometime after lunch. I assumed it closed after someone saw how successful it was and wanted protection money. 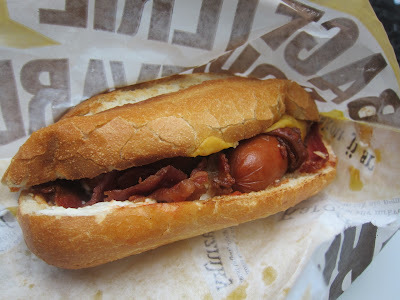 I was at IKEA this weekend and I'll now say that I think they have the best hot dogs in Prague. Too far from the center, though. is there anything like this in Prague? bunch of small appetizers for a big price . Jiřího z Poděbrad‎. Never tried it though. With Pho Vietnam around the corner I probably never have to either. Hey thanks for the info... great sushi place! !